Hola Foodies! What’s cooking out there in your kitchens? Time for you people to roll up your sleeves and start cooking as today I will be sharing a recipe which is very close to my heart and easy to make. Now when you have all these ingredients in your basket, start cooking. Spread bread pieces on plate and decorate them with cheese spread. Now gently sprinkle chopped onions, bell peppers, olives and mushroom over the bread. 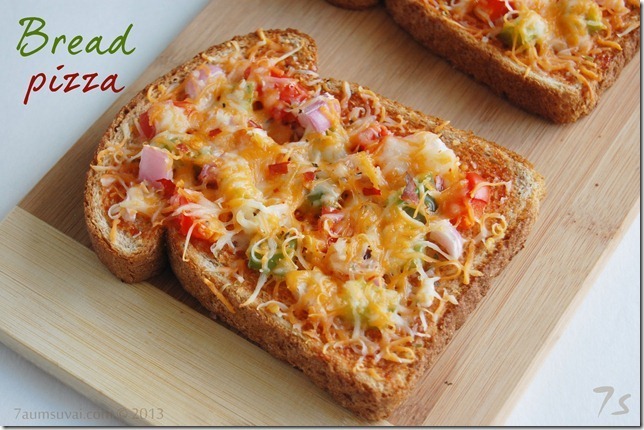 Now style the bread with cheese like a diva, put lots and lots of cheese and don’t count the calorie count. Pre-heat the oven and then put in the bread pieces till the time the crust gets crunchy and the cheese is melts with a beautiful golden brown color. Once it is done take out the slices and top them with tomato ketchup and mustard sauce and serve them hot with your favorite drink. Bread pizza, it’s simple! It’s delicious and you can DIY! Time for me to push off!! Bye-bye eaters and keep cooking!